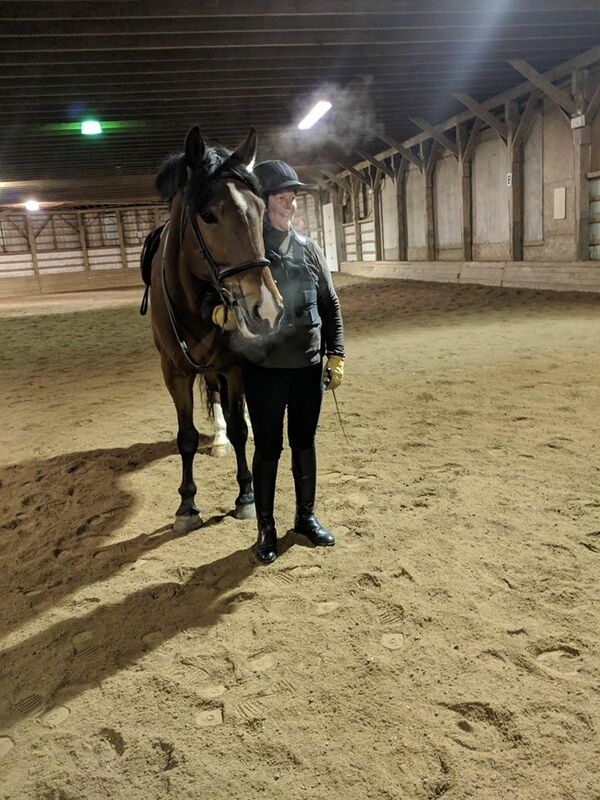 There is so much to say about Pat Steele because she has been an instructor, a rider, a volunteer, and a great Lancer and it is for that reason she is our featured adult rider of the month! Pat has been at Lancers for at least the last decade but her love of horses started long before that. Her mother always says that ‘a pony’ was on the top of Pat’s Christmas list. Pat grew up across the street from Philip and Mary Oland who started up a branch of the Canadian Pony Club, the Rothesay Pony Club, on their property. But Pat never asked her parents for riding lessons because they wouldn’t have offered something to her that they couldn’t also offer to their other four children. Financially, it wasn’t an option. But Pat was allowed to go to the barn every day after school to muck stalls with the stableman, Goldie, and would ask riders if she could clean their tack or lead their horse for their cool out. She explained, “I think Goldie and the Olands must have felt sorry for me because out of the blue, the Olands spoke to my parents and discreetly offered me a working student position. I don’t know if they did that for anyone else but I will be forever grateful for this kindness. So I started lessons at about age 13”. As a junior rider, Pat competed in horse shows and three National Pony Club Rallies and she achieved an A level, the highest level that Pony Club awarded. She also competed in eventing up to preliminary level, which includes dressage, cross-country and stadium jumping. She took and passed her Pony Club A test at age 20. She achieved her Level 1 Coaching certificate in 1978 when she was actively involved with the Canadian Pony Club. She was an instructor at both the Rothesay and the Fredericton Pony Clubs. Life eventually got in the way a bit and took her away from horses but when she was about 54, she got back into riding. She joined Lancers and it was great to be just down the road. She recalled, “at first, I rode once a week and the next day I would walk like John Wayne - the old abductors liked to complain. 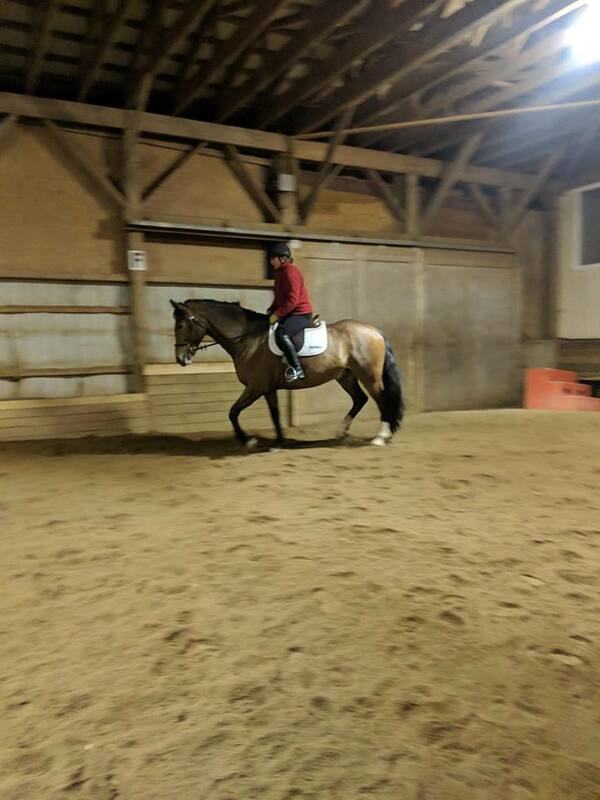 It was great when I was riding twice a week.” Pat then joined Lancers as a Level 1 coach and taught on Thursday nights. Last year she also helped with the Therapeutic Riding program. This year, she pulled back on her commitments to allow her extra time with her parents in New Brunswick. She also decided to take some time to refocus on her own riding and she now rides in A1 on Tuesday nights. At 68-years-of-age, she says, “every day that I get on a horse is a good day”. Pat strongly believes that if you are a member of an organisation, it is fundamentally important to participate in the activities of that organisation. She signs up for events at the barn to (give tours on Open House, bring food for BBQ’s, parties, canteens, etc.). For many years, she has volunteered as part of the jump crew at the Downtown Horse Show and every year she helps with the August clean up and repairs. This is our only chance every year to get major structural repairs and cleaning done while the horses are out of the barn and Pat feels that it is an important obligation for anyone who is serious about horse care and/or wants to take pride in the Lancer barn. For Pat, the best thing about Lancers is about horsemanship which means it’s not just about riding a horse. According to Pat, it is about learning to care for the multiple facets of a horse. She added, “I don’t think I could ride at a barn that didn’t take care of their horses or treated them like machines. Also, I rode a lot of different horses as a kid and young adult. Some were probably not sensible choices. At my age, I like that the quality of ‘school horse’ at Lancers is pretty high and that rider safety is an important component of instruction”. Pat is currently on the hunt for a ‘favorite’ horse at Lancers. She feels it is good to ride a variety of horses to improve your riding skills, however, it does take time to get in sync with a horse as you refine your communication with each other. Pat has always been athletic and played various sports throughout her life. Nowadays, she does a little tai chi, aqua fit, yoga and swimming but her favorite is definitely time at a barn. In the future, Pat hopes to continue riding. 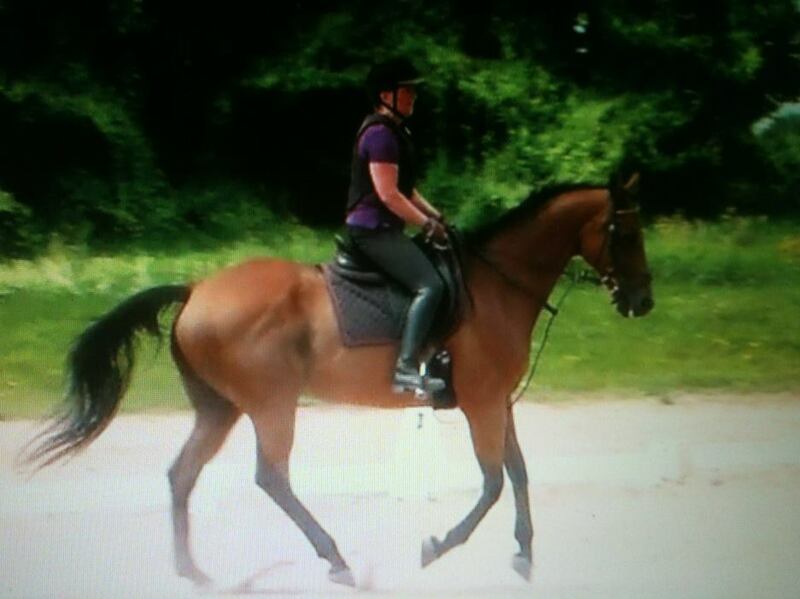 She notes that she is lucky to be healthy and she hopes to have a good ten year of riding in her future at least! She has told her kids that when they put her in ‘a home’, she would like it to be next to a pasture with horses, or even little Shetland ponies roaming around. “And if that isn’t possible”, she added “just record a bunch of horses and put it on a loop on a big screen TV and tell me it’s a window”. Pat, thanks for being an important part of our Lancer community! Here she is at Lancers (bundled up in layers to stay warm)! Her other photos include: "The most two recent pictures are when I took myself to Sue Fraser's Dressage summer camp - about 4-5 years ago (age 63 or 64). One photo from the distant past was from the National Pony Club Rally in 1970. I represented the Maritime Team at three National Pony Club Rallies: 1967 in Bromont, Quebec; 1968 in Saskatoon, Saskatchewan; and 1970 at Hobby Horse Farm, Coldbrook, NS. The other photo was taken the year after Maggie was born. I was coaching at the Rothesay Pony Club but with two kids under the age of three I hadn't been riding much. However, a spot opened up 3-4 days before a three-day event clinic with John Kersley. I rode this horse for the first time in the clinic because no one else wanted her."